Congratulations to Michelle McDonald-Ross, November's Bride of the Month! We are so pleased to be sharing Michelle's invitations with you. Michelle came to us with an awesome pinterest board flushed out with lots of inspiration. As we sat down with Michelle and talked about the items she had gathered for inspiration we were able to get a feel for Michelle's laid back attitude and easy-going style. By the end of a very productive consultation the scope of her invitations started to come into focus with a size and shape selected, a color palette nailed down and we figured out the different pieces she would need. 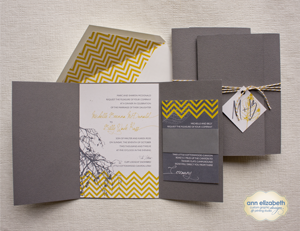 Michelle wanted a chevron pattern as well as an autumn branch, tree or leaf to be incorporated into the design. It was a unique combination and we knew we had our work cut our for us. 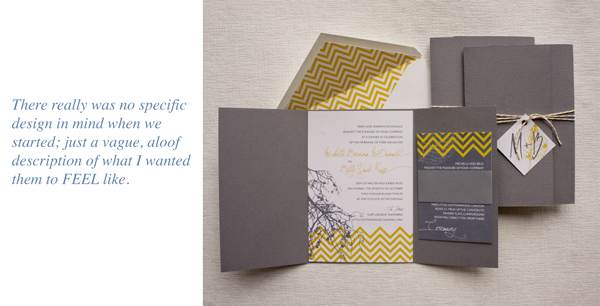 Our invitation consultant Ruth Sorenson sat down with Michelle to get her take on the process. Here are the highlights from our interview! Ruth: One of my favorite things about your invitations was that you challenged us to create an invitation set that had contemporary elements combined with nature elements, what made you decide on those two elements? Michelle: I was kind of nervous before meeting with Ann Elizabeth because I knew how I wanted the invitations to feel and I was thinking "how am I going to make these guys understand what I want based on a feeling?" I knew I didn’t want rustic and I didn’t want cold. I was also concerned because people can have different ideas of what natural and modern look like and I wasn’t sure how to explain what I envisioned. It was really good to sit down at the consultation and just rap it out. There really was no specific design in mind when we started; just a vague aloof description of what I wanted them to FEEL like. Letting me talk about what I wanted the invitations to feel like and looking at colors and papers led me to those two main ideas. Ruth: What helped you know when we got the right combination you were looking for in your design? Michelle: When we started the proofing! It was awesome to be able see the different options that Ann came up with based on our consultation. I was able to be selective and let Ann know what I liked and didn’t like. The visualization process worked. For example, I had initially wanted a die-cut leaf for the front of the invitation, but once I saw it in proofs, I realized it wasn’t right for what I wanted. As things started to narrow down to the final decision I was like that’s it! Ruth: What is your favorite part of the invitations? Michelle: It’s hard to narrow it down to one thing because I like that it’s a whole package and everything works together. If I have to pick out a few favorites, I do really like the envelopes liner. I think it’s just a cute detail. I had also forgotten that we picked a textured paper for the wrap and when we got them I thought they were even better than what I remembered from the computer proof. I like the string tied around the outside as well. It makes the invitation interactive and a fun experience for the guest. Guests want to feel like they’ve been invited to something special and I really feel like my guests got to experience that with the invitation that I sent them. Ruth: Have you had any feedback from your family and friends? Michelle: Yes, A friend of mine in London said “this is the most beautiful thing that I have ever had the pleasure of receiving.” We also received a lot of comments about the RSVP. Everyone though it was fun and showed a little of our personality. Ruth: Did the invitation process help set the tone for any other parts of your wedding? Michelle: It’s funny because we ended up changing our wedding completely during the time that we were working with Ann Elizabeth. We initially had a bigger event planned at LuLand Falls that included a caterer, florist and all of the more traditional elements. It started not being fun I realized my event wasn’t looking like me anymore and we cancelled all of the traditional stuff and reworked our wedding to be a really small, special ceremony with close friends and family outside and then a celebration dinner at snowbird. Once I made those changes I got excited about getting the wedding that wanted. Going through the invitation process was part of the catalyst that helped me decide I needed to rework things. The invitation process was more relaxed and fun. I wanted everything to feel that way. The invitation helped me to define what I wanted the wedding to feel like. Ruth: How was your experience working with the Ann Elizabeth team? Michelle: Great! I really didn’t know what I wanted and I was amazed with the proofing process all the different ideas Ann came up. You guys really listened to my vague vocalizations and were able to manifest them into the perfect invitation. Even my parents and Bill had fun going through the process with me and it was fun to get their opinions about the process. Most of all I love the end product. Ruth: Do you have any advice for any newly engaged ladies getting ready to plan their events? Michelle: Listen to your instincts. If you like something and it feels right build on that even if it’s vague and hazy at first. Try to be vocal with the wedding professionals helping you so they can guide you by asking the right questions to ultimately help you have the most enjoyable experience. Start building a selection of images that appeal to you. In situations where words fail, images will speak. Thanks Michelle! We had a great time working with you. For all of our pinterest fans, here's your pinnable.